The AR.Drone's accompanying iPhone app, FreeFlight, has recently been updated to version 2.0 (2.1 at the time of this writing), and is now new and improved, with easier to use navigations, overlays, and sharing options. So what, if any difference does it make to new and old Droners alike? 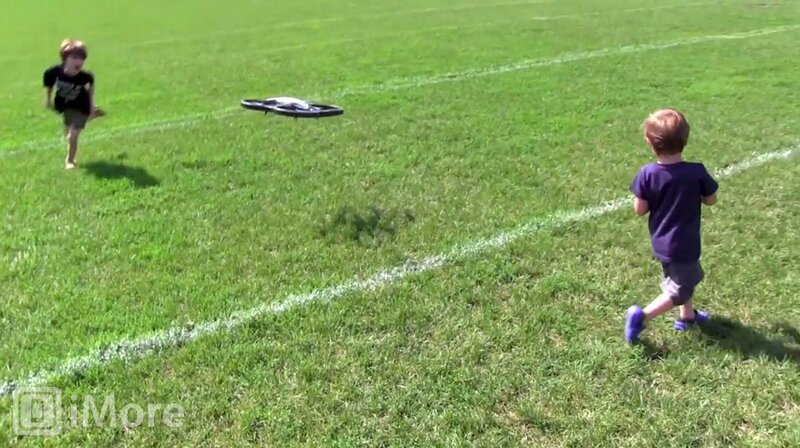 If you're not familiar with the original AR.Drone, it's and iPhone-controled flying contraption with a design that wouldn't look out of place in a James Camera film like Aliens or Avatar. It has a front facing camera that is viewed in real time as well as a downward facing camera for when you want to take some cool aerial shots. The AR.Drone also comes with 2 different Hulls -- a minimal and highly visible hull for outdoor, use and a more protective Hull for indoor use. I quickly noted that these hulls can also be classified as "I love my Kids and want to secure their safety", and the "I don't have or care about kids". So, I typically stick with the “safety” hull even for outdoor use. After placing the battery in the charger, I waiting for the LED to show full. In the meantime, I searched the App Store for the FreeFlight 2 update. I say searched because there are now two versions of FreeFlight available. There's FreeFlight 1.0 which is compatible with the iPhone 3G and iPhone 3GS, and the original AR.Drone, and the regular FreeFlight which is now on version 2.1 and compatible with pretty much everything, including the original AR.Drone Parrot and the new AR.Drone Parrot 2. Getting going is simple enough. 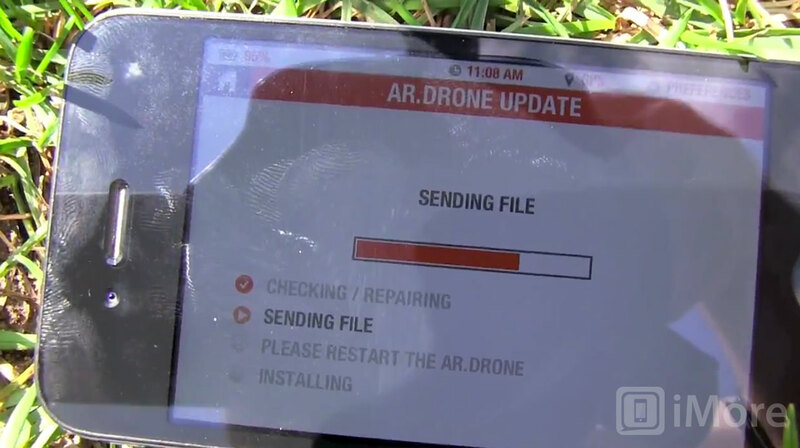 One the AR.Drone is on, it in effect becomes a Wi-Fi hotspot to which you connect your iPhone, iPad, or iPod touch. That establishes an IP connection to the AR.Drone from your iOS device. Once I started the FreeFlight 2.1 app, I was presented with an option to update the AR.Drone Parrot’s firmware. The process is straight forward except, once the firmware is loaded, you're asked to restart the drone, and there isn’t any indication of how long the firmware update will take. I simply waited about 10 minutes before I tried to use the device. Once updated, I used my little helpers to put it to work. There was a stiff cross wind but the AR.Drone was able to compensate and kept its stability. I was quite impressed. The charge lasts for only about 20 minutes but this was plenty for my team to run it through its pace. In pilot mode their are more options such as a trim to balance the AR.Drone for take off, A swap button to swap from front camera to underbelly camera, and limiters to limit speed and height from the ground. The FreeFlight 2.1 app also has various game modes that you can follow once you have upped your flying skill level. You can view and share your recorded flights and easily share to Facebook or Twitter. 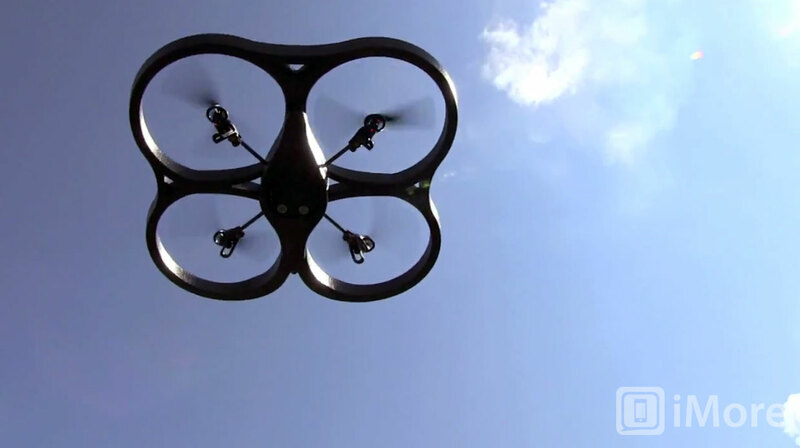 The AR.Drone website has a multitude of how to videos to teach you how to pilot from beginner to more advanced techniques as well as a store to purchase spare parts, batteries, Hulls, propellors and more. Which you may need, depending on how vigorous your own team of testers proves to be. 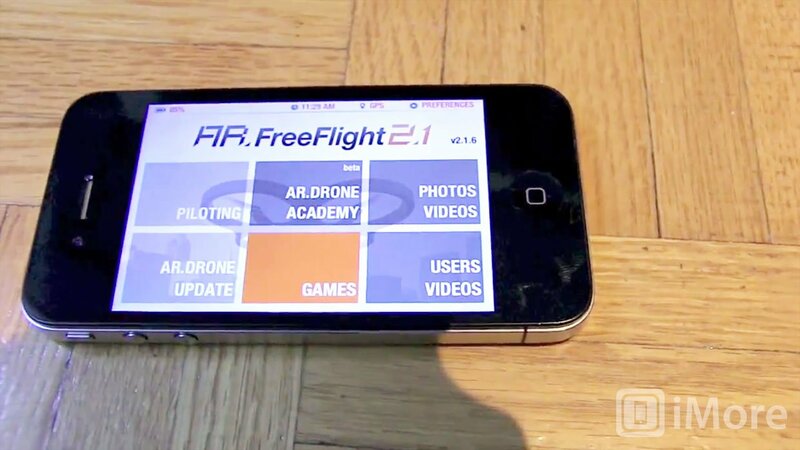 Overall, the FreeFlight 2.1 update makes a fun iPhone or iPad toy even better. The controls are smoothed out, the social sharing is there if you want it, and the games are better implemented. Personally, I still find simply flying the AR.Drone and coming up with my own activities far more enjoyable than following some pre-established game, but if you like your fun more structured, there's definitely more structured fun to be had.